On August 17, AltaRock led a tour of over 50 visitors up to the Demonstration project site. 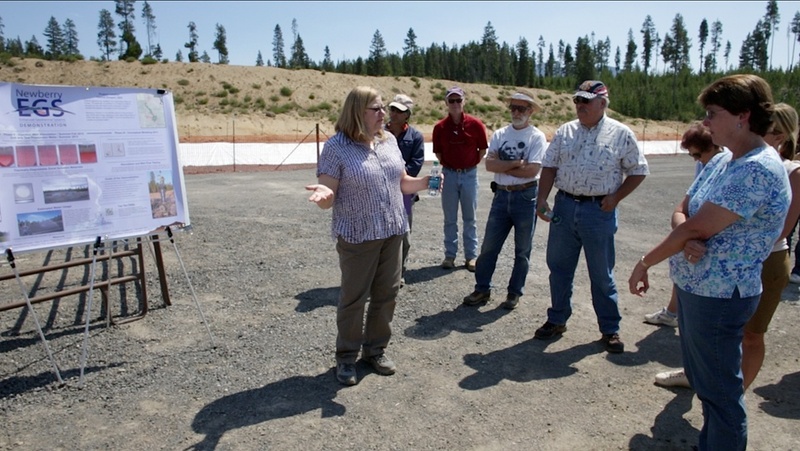 The visitors included members of the La Pine Chamber of Commerce, a Deschutes County commissioner, staff from two state senators, La Pine officials, and local residents that had expressed interest in a visit. In the picture above, AltaRock’s president and founder, Susan Petty, explains that the thermally-degradable diverter materials that we will be using to stimulate multiple zones are similar to the plastic in the bio-degradable water bottle in her hand. The most common question from the visitors was, when are you going to get started? We are currently hoping to start the pumps on about October 1. More on that soon.